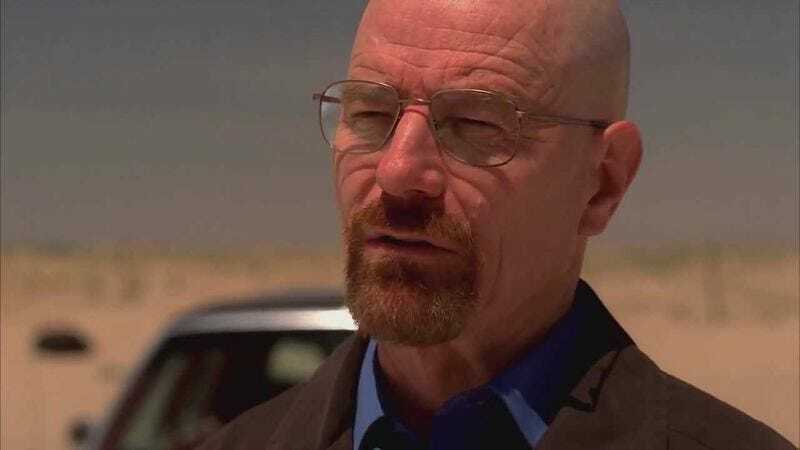 Walter White might not be showing up on Better Call Saul any time soon, but he did pay a visit to the Electric Daisy Carnival’s multi-day electronic dance music festival in Las Vegas recently. Well, sort of. To introduce Above & Beyond’s hit dance track “Walter White,” Bryan Cranston himself showed up on stage and terrified a bunch of ravers by calling out one of his beloved Breaking Bad catchphrases: “Say my name!” and then “You’re goddamn right.” Cranston then had the honor of hitting the “play” button on Above & Beyond’s music machine, kicking off a few hours/days of people bouncing up and down while waving their arms in the air and screaming about how much they love various beats. It’s a little hard to tell what’s going on, what with all the flashing lights, fireworks, and god-like owl statues, but that’s all part of the EDM aesthetic. If you just want to see Cranston, you can see his clip—and hear “Walter White”—below, but head over to Yahoo Screen if you’re down with various beats, flashing lights, and owl gods.